"Metro Manila", or the agglomeration of the historic city of Manila plus Quezon City, Pasig, San Juan, Makati and thirteen other neighboring towns and cities, is a big, sprawling mess of modern skyscrapers, worn-down warehouses, stately houses and slums. But skipping Manila means you skip out on an interesting experience. Even the much-warned-about transportation in Manila can be easy (at the very least, tolerable) if you follow a few simple rules of thumb. Terminal 2 (location on Google Maps) hosts Philippine Airlines domestic and international flights; Terminal 3 (location on Google Maps) hosts PAL Express and Cebu Pacific domestic and international flights. And the domestic terminal (location on Google Maps) hosts SEAir and ZestAir domestic flights. NAIA is not connected to the city's rail system; the easiest way to get out is by riding one of two taxi types that wait at the arrivals area of any of the four terminals within. Find out how to manage Ninoy Aquino International Airport in Manila. Coupon taxis do not have a taxi meter; instead, these cabs charge a flat rate depending on your destination. The arrivals area dispatcher will take your name and destination, and issue a coupon in exchange for payment. Present the coupon to the driver and off you go. Coupon taxis are colored white, with blue squares displaying the car number. These taxis are ideal for families and/or tourists with plenty of baggage, as you can ask for a large van-type coupon taxi that can accommodate your whole load. Airport metered taxis charge a flag-down rate of PHP 70 (US$1.65) with an additional PHP 4 per 300 meters. These prices are somewhat higher than what you pay for in an average taxi in Manila; on the other hand, these taxis are more honest than your average taxi driver. A single shuttle bus links NAIA Terminal 3 with the Pasay interchange (location on Google Maps) connecting Manila's two main light rail lines, the MRT and the LRT (further divided into lines 1 and 2). Riding the rails can be fun if you strictly avoid riding during weekday rush hours (7 am to 9 am; 5 pm to 9 pm), when each train car transforms into a seething mass of tightly packed people. Fares cost between $0.25 and $0.50, stored in magnetic cards that you stick into turnstiles for easy access. The MRT (blue line) reaches the Makati business district (via Ayala Station), the Ortigas business district and the sprawling SM Megamall (via Ortigas Station) and the Trinoma shopping center/SM North Edsa Mall (via North Avenue Station). The LRT (yellow line) reaches Malate (via Vito Cruz Station), Ermita and Rizal Park (via United Nations Station), Manila City Hall and Intramuros (via Central Station), and the SM North Edsa Mall (via Roosevelt Station). Access to the MRT and LRT stations is badly designed as a rule: few of them have working escalators and elevators, and most elevated stations can only be reached by tall, steep stairs from street level. A few stations offer direct access to neighboring malls. For more information, read our guide to Manila's commuter rail system. Air-conditioned and regular non-aircon buses cover many major routes throughout Metro Manila and outward. These buses are mostly used by local commuters to get to and from work. Fare for Manila buses cost between $0.20 and $1, depending on the distance of your trip; tickets are issued by "conductors" on the buses, whom you pay as they pass by on the bus aisle. Wildly colorful jeepneys ply most of Manila's secondary roads, and will set you back about $0.15 (PHP 8) for a short ride. 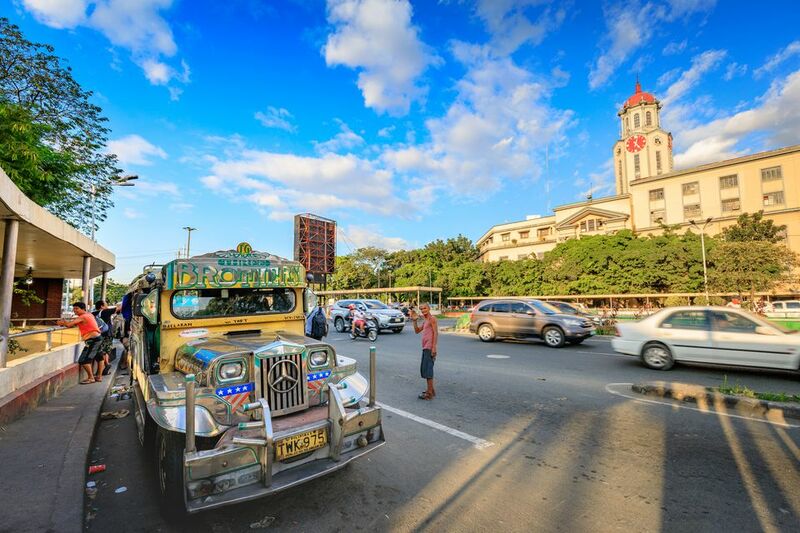 Buses and jeepneys are hard to understand if you're a first time Manila visitor, but if you can hack them, these offer the cheapest way to get from point A to point B within Manila. To make sense of the transport situation, the website Sakay.ph ("sakay" means "to ride" in Filipino) allows travelers to input points A and B, upon which the website generates a route using the MRT/LRT, bus and jeepneys along the way. Manila's regular taxis are all air-conditioned and metered... but have a rather unsavory reputation even among locals. Taxis are notorious for not returning the correct change, overcharging tourists, and sometimes even mugging their fares. Flag down fare is PHP 40 (about $0.90) with an additional PH3.50 ($0.08) per 300 meters. If you have a smartphone, you can use the GrabTaxi app to summon a cab to your location, if you don't mind being charged an additional PHP 70 ($1.60) for your ride. If you want to drive yourself, car rentals are easy to arrange through your hotel, or directly with a reputable car rental company. The law requires drivers to be at least 18 years old with a valid international driver's license. Traffic in the Philippines drives on the right-hand side of the road.